I love when I find a great healthy recipe that doesn’t feel like it is supposed to be healthy. 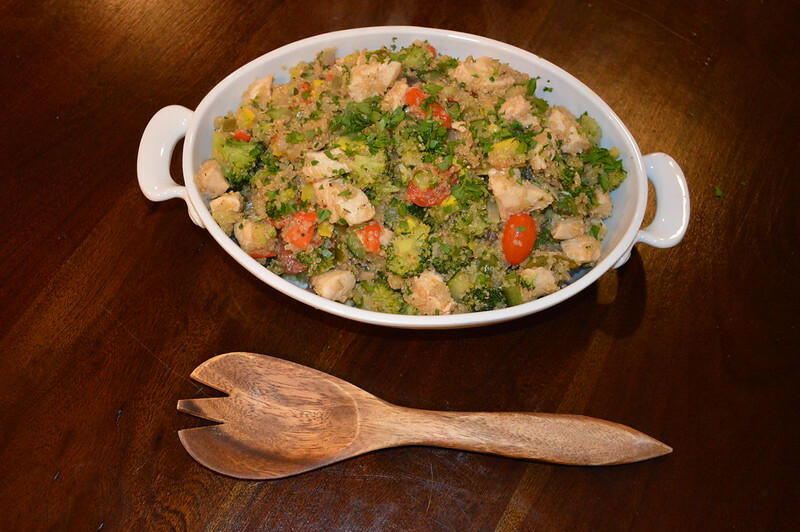 This chicken and garden veggies quinoa skillet is exactly that. It’s extremely healthy for you, yet you would never know. 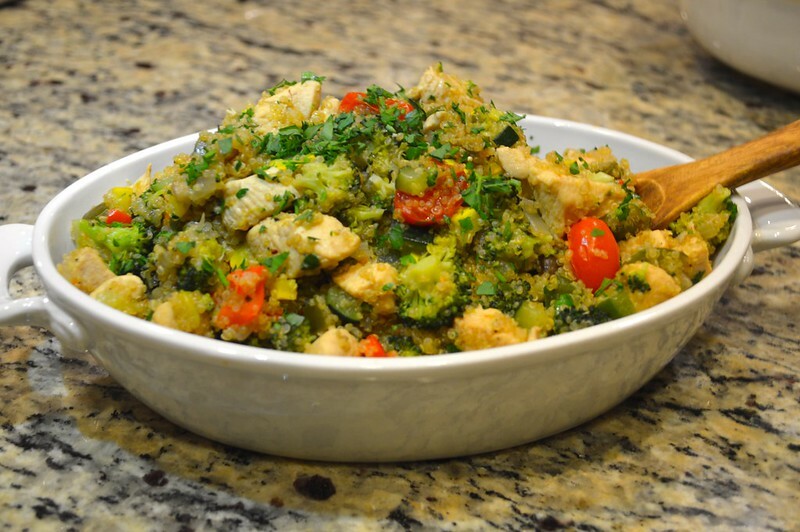 The perfect savory dish to fill you up, this quinoa skillet is loaded with all of the good stuff; grilled chicken, healthy grains, and loads of veggies. The fantastic thing about this dish is that the veggies can really be any combo of what you have in your fridge at the moment. I have done it a different way every single time, based on whatever vegetables are in my crisper, and it’s delicious each time. Better yet, the the meal can be made in just under 40 minutes, which makes it the perfect go-to dish for a weeknight meal. I recently made a veggie-only version of this dish when I had some vegetarian girlfriends over for dinner, and they absolutely loved it! While we were cutting calories by eating this, we didn’t feel as guilty indulging in a second glass of wine! Preheat large deep skillet on medium-high heat. Add olive oil, onion, garlic and cook for 4 minutes, stirring frequently. 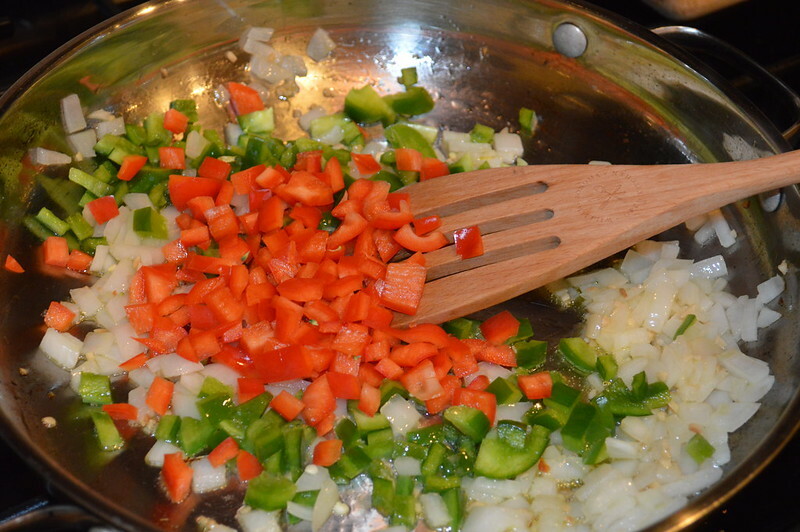 Add bell peppers and saute for 3 more minutes, stirring frequently. Add chicken and saute for 5 minutes, stirring occasionally. Sprinkle with salt and pepper, add quinoa, water, bay leaves, and stir. Bring to a boil, cover with a lid, reduce heat to lower medium, and cook for 12 minutes. 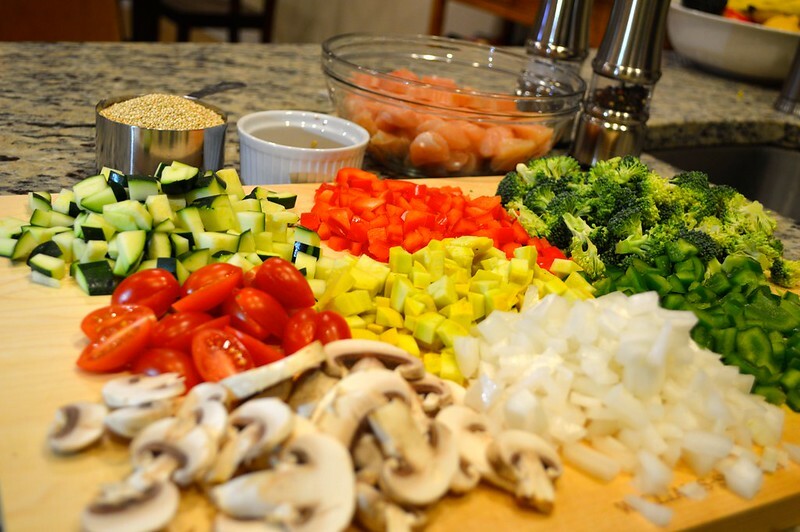 Now, it’s time to add vegetables. At this point quinoa should be cooked al dente. * Add zucchini and broccoli. Stir, cover with a lid, and cook on low-medium heat for 15 more minutes. Add grape tomatoes and parsley, stir and remove from heat. Serve hot.